Do you like rambling in the countryside around Aix? Are you interested in the flora and fauna? If so, you might like to try Ecobalade, a recently-launched free app. is that?’, and has been called ‘simple, ludique et educative’. 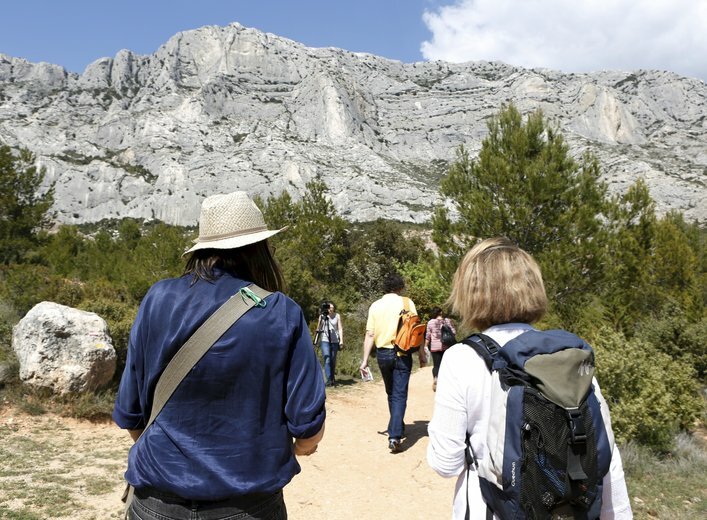 There are 20 walks included, 3 of which are around the Sainte-Victoire; and there is one each around Jouques, Rognes and Puyloubier. Each of these walks has descriptions and pictures of between 70 and 100 birds, insects or plants which you may well see. One of the walks is a 3-hour tour of the river Arc, south of Aix Val St André. Living nearby, I am very pleased to read in the town publication ‘Le Mag’ that this whole area is going to be cleaned up with new facilities installed. It needs it. Dead trees will be removed and there are plans for picnic benches and family-friendly areas with play-parks and boules pitches. There will be additional parking and footbridges over the river. Disabled people will be able to access some of the paths too. Work should be completed by 2017.